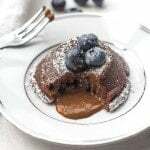 Treat yourself and indulge in easy to make, rich and gooey, mini molten chocolate lava cakes. Melt the chocolate and butter in a medium, heat-proof bowl over a pot of hot water (for clearer instructions on how to melt chocolate, refer to my link below). Once melted, remove the bowl and set aside. In a small bowl, mix together the sugar, flour, cocoa powder and salt. Slowly sift the dry ingredients into the chocolate mixture. Beat on low using an electric hand mixer. Add eggs and egg yolk and continue to beat until the eggs are fully incorporated into the mixture. Add vanilla extract. Beat on high for 3 minutes until the batter is creamy. Chill the batter in the refrigerator for at least an hour. When you are ready to bake, preheat the oven to 400 F.
Generously grease the bottom and sides of the ramekins (or muffin tray) with butter. Brush some cocoa powder inside the ramekin and shake off any excess powder. Gently invert each cake onto a plate. Sprinkle some icing sugar on top and garnish with some berries. Serve with a side of vanilla ice cream.